I've been wanting a new photography board to take all of my food pictures on for some time now, and Chris was thoughtful enough to surprise me with a board he made me for Christmas. So it was only suitable that my first picture on my new board was a concoction Chris came up with! I had both of our families over for Christmas dinner and made a typical Italian feast. Eggplant Parmesan, Lasagna and meatballs in homemade marinara sauce (both with and without meat) were on the menu. 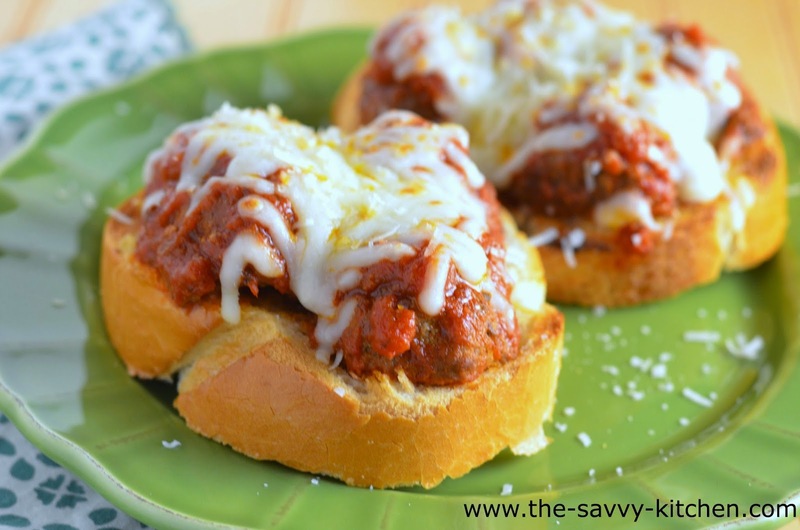 We had tons of leftovers, so Chris made these Open Face Meatballs Subs for dinner the next evening. He spruced up the bread with a garlic butter mixture and then topped it off with some Mozzarella cheese. They make you feel less guilty since less bread is involved, but they are still extremely filling and delicious. Enjoy! Make marinara sauce as directed, or use store-bought sauce and heat in a saucepan over medium heat. Add meatballs to the sauce and allow to heat through. Meanwhile, preheat broiler to medium heat. Mix hot melted butter and garlic together. Spread butter mixture on both sides of each slice of bread. Place under the broiler for 1 minute per side, or until the bread is toasted and begins to turn light brown. Remove from the broiler. Place bread on a baking sheet. 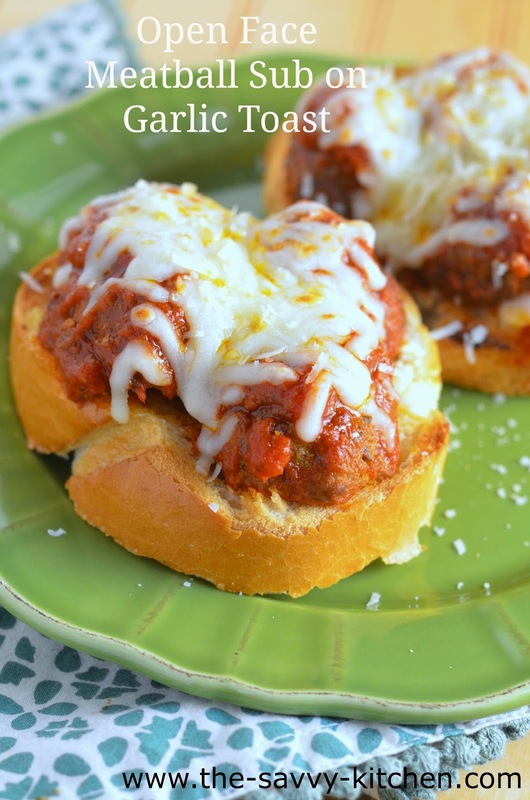 Top each slice of bread with four meatball halves and a little sauce. 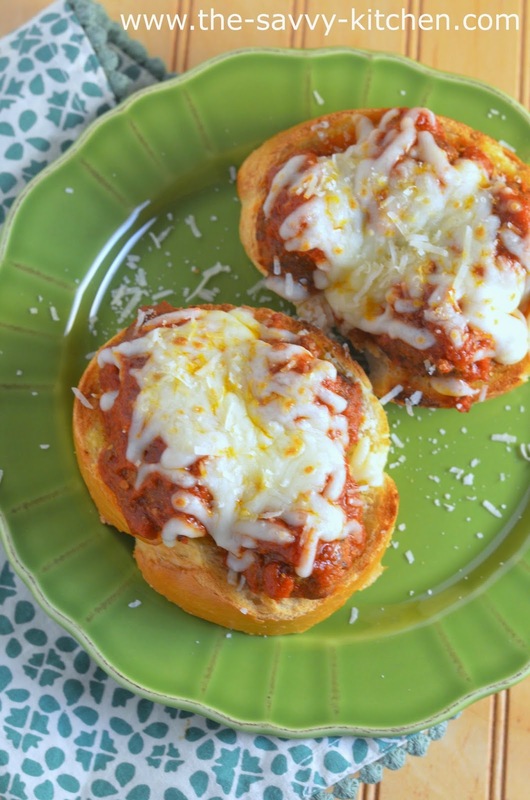 Sprinkle Mozzarella and Parmesan cheese evenly over top of each slice. Place under broiler for 1-2 minutes, or until cheese beings to bubble. Serve immediately.